From shopping streets to traditional markets in Seoul, there are numerous places that attract not only the shopaholics, but also the average visitors. Despite not being a true shopaholic, we made it a point to visit the notable shopping streets and markets during our visit to Seoul. Along these streets and markets, there are hundreds of shops, street stalls and display stands in the alleys. They are filled with a wide variety of items and it’s vibrant with people bargaining over prices. But sometimes, bargaining is not an option at all. Anyway, with the help of the Tourist Map, we managed to find our ways to the 4 main shopping locations, namely Itaewon, Namdaemun, Insa-dong and Myeong-dong. First on the list was Itaewon Street. 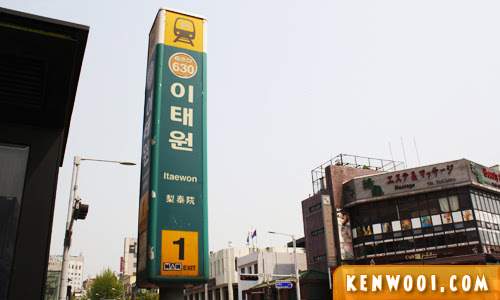 Travel Tip: To reach Itaewon Street via the Seoul Subway – get off at Itaewon Station (Exit 1 or 2). 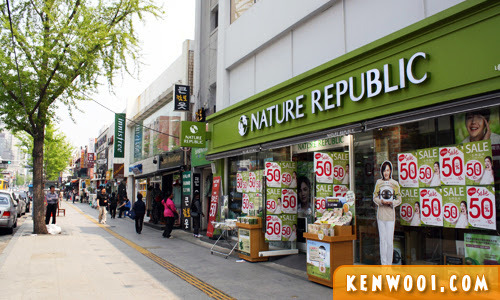 The main street of Itaewon is pretty similar to the other shopping streets. There are thousands of stores clustered together with shopping centers, from shops selling clothes, shoes, and bags, to restaurants, travel agencies, and tourist hotels. 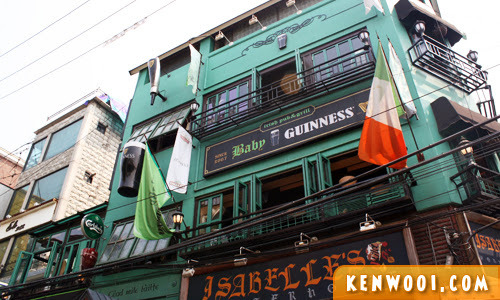 According to the locals, Itaewon is popular among foreign tourists for a long time. But now it also attracts Koreans who appreciate more modernized customs such as brunch and the party culture. Plus, there is an International Street where you’ll be able to see different types of cuisines from different countries around the world. It’s more like a hangout area for those who wish to experience un-localized food. Or course, this is not our target destination – we’re suppose to eat only Korean food! 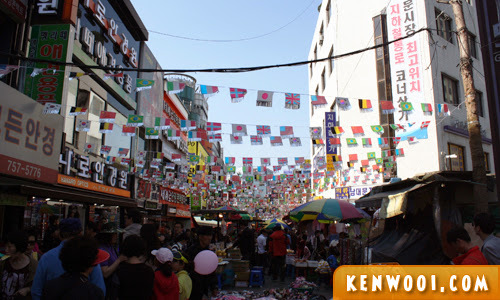 Next, Namdaemun Market is the largest market in Korea. 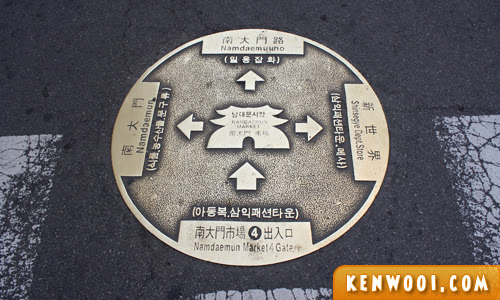 Travel Tip: To reach Namdaemun Market via the Seoul Subway – get off at Hoehyeon Station (Exit 5). Countless shops and street stalls line its alleys, selling clothes, household items and food – whatever you want, you name it, you’ll definitely find it there. 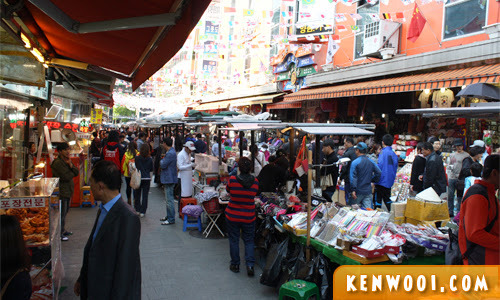 As the place is famous for its reasonable prices and the generous hospitality, many foreign tourists who visit Seoul are known to stop by the market. 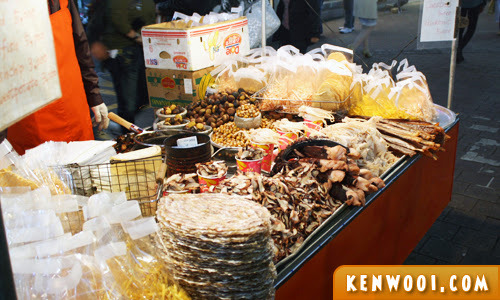 There are a lot of food alleys in Namdaemun Market, where certain local food are especially popular. A favourite shopping street has to be the Insa-dong Street. 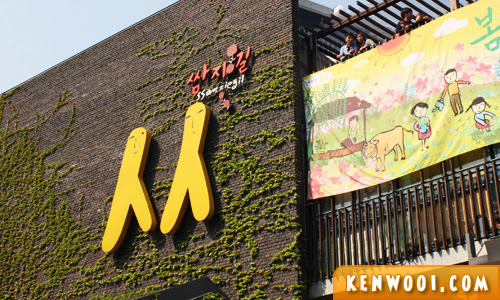 Travel Tip: To reach Insadong Street via the Seoul Subway – get off at Anguk Station (Exit 6). Walk 100m straight, then turn left. 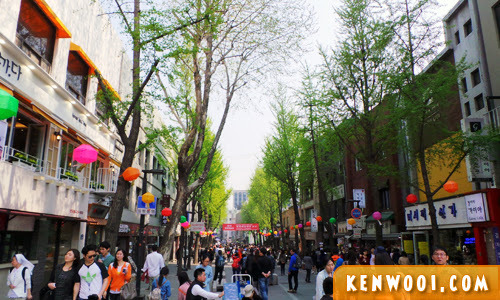 It’s a street of Korean traditional culture with antique art and book shops, traditional teahouses and craft shops. It is one of Seoul’s leading gallery streets and has been the location of many art galleries since olden days. There are even young Korean ladies selling stuff on the streets. Anyway, it’s quite fun to find so any different kinds of items. Ssamzie-gil, where design goods reinterpreting tradition in modern ways are sold, is highly popular. Snack carts selling food and snacks on the streets add to the unique atmosphere of the area. After all, what’s a shopping street without food? 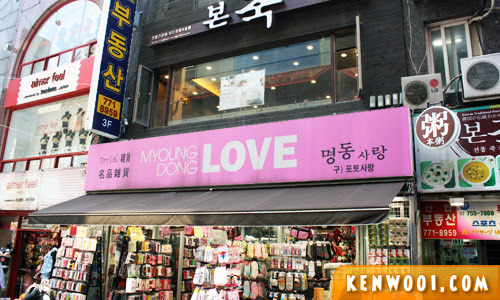 Another top shopping destination has to be Myeong-dong Street, or also known as the Myeong-dong Fashion District. 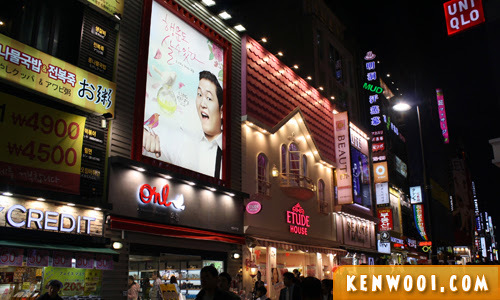 Travel Tip: To reach Myeong-dong Street via the Seoul Subway – get off at Myeong-dong Station (Exit 6). Since it’s located very close to Namsan Guest House (the place we stayed during the trip), we visited the area pretty often. It’s like a must drop by destination whenever we’re back in Myeong-dong area. By day, it’s a shopping district filled with flagship stores of major global brands, large local brand stores, accessory shops and even restaurants. And by night, the surrounding streets within Myeong-dong are occupied with individual stalls selling all kinds of things – some sort like a night market. 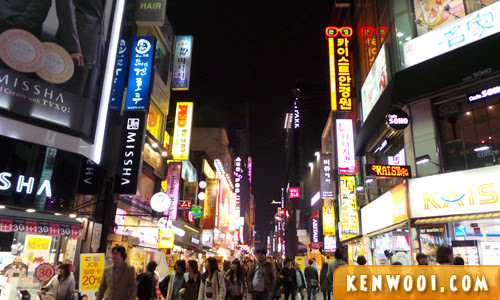 To be frank, going to Myeong-dong market during the night is a fun adventure. There are so many things to see and discover – it’s like the night would never end if we don’t stop exploring the area. Additionally, the Korean street food is just attractive and tasty. For more about our Korean food discovery in Seoul, read up Soul Food of Seoul which I’ve written previous. Now, you may wonder why Myeong-dong is also called the Fashion District. The reason is very obvious – just look at the shops! They have Psy as the ambassador for some facial products. Etude House and Uniqlo are also just around the corner, and more big brands locals at other corners. 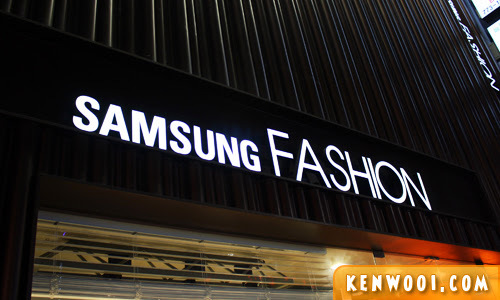 Furthermore, Samsung is very fashionable in Korea! 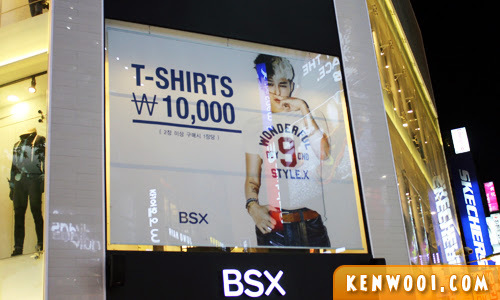 Here in Malaysia, the Samsung smartphones are trendy nowadays, but in Korea – they’re making it a fashion! Last but not least, the reason is obvious when you see a sissy K-pop male artist promoting an outfit… while sniffing his finger! I mean, is his finger smelly there or what? And also, what’s with the black and white hairstyle? Know what, he looks like a granny who didn’t completely dye her white hair! Okay, I think I better stop there. After all, shopping at the streets and markets in Seoul rocks, but K-pop dudes like him… meh. ahem ahem…where is the food? only one pic…..? I like insadong.. too bad i didn’t get to stay there for long during last visit. 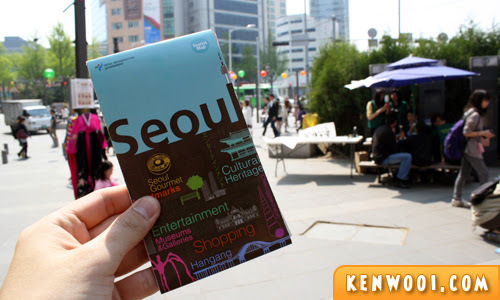 Seoul is a must revisit city for me! Was it a DIY trip? Was is easy to get around if one does not know Korean? Hi Winnie, yes it was a DIY trip. It’s easy to get around since it was planned and the subway is convenient to travel with. How bout ordering food at restaurants? Any problem? Do they normally have pictorial menus? No issue with ordering food, and most of the menu comes with photos. The menu is usually written in alphabetical letters where you can actually read them. Hi Charmaine, yes it’s walking distance from Namsan Guest House. It takes about 5 minutes to reach there by foot.